I love this house, though I don’t get to see it as much as I’d like because of where it’s located. 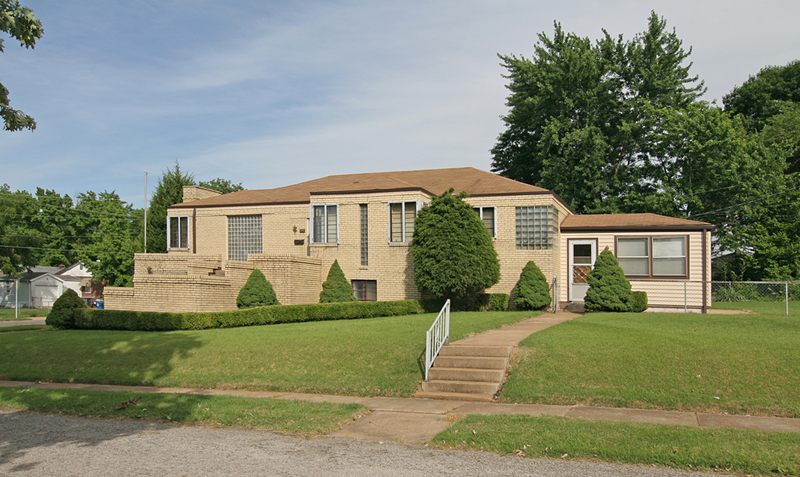 The tiny, St. Louis County inner-ring suburb of Bella Villa has a reputation much larger than its population of roughly 700 residents. It’s a notorious speed trap, with 59% of its 2005 municipal budget coming from traffic tickets. And though I don’t typically drive crazy fast while gawking at scenery, it does conjure abrupt stops and lane changes for the sake of a photo, and that’s enough to get pulled over and ticketed in Bella Villa. On the afternoon I took these photos a cop seemed to magically appear from nowhere and pulled someone over. I kept that business out of the left side of the frame in the photo above. Even though I was relatively safe being on foot, all the horror stories heard over the years ran through the memory bank, and I slowly slinked away to my car parked around the corner. Ah yes, the house itself! It was built in 1938, and the houses right around it on this end of the block all range from 1938-1940. It’s vaguely art deco and reminds me of some of the places Harris Armstrong was designing around the same time – like this or maybe this. I also love the Lego look and feel of the house, especially in the way the garage, front steps and entry are attached to the main house. Also, the house is nicely situated atop a hill, so has the added drama of a stone wall on the side, and a nice high perch from which to watch the speed trap below. 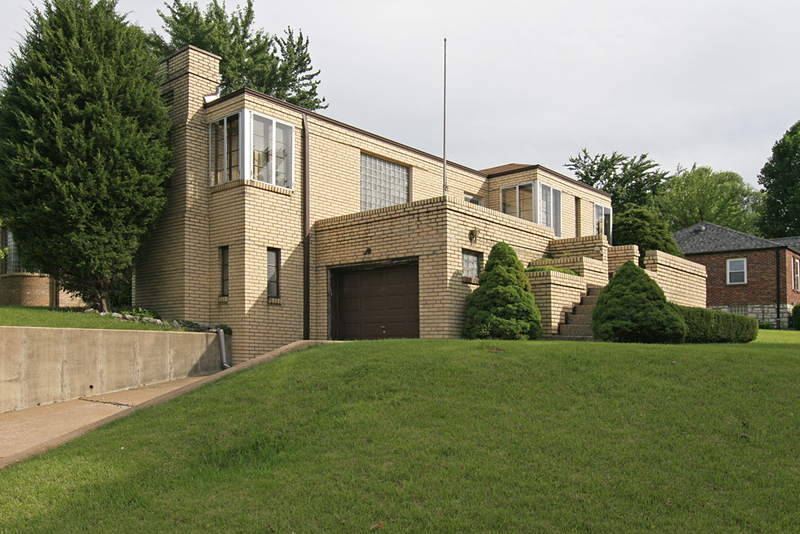 This entry was posted in housing, mid-century modern, south st. louis county and tagged bella villa, harris armstrong, ruprecht, south st. louis county, speed trap by Toby Weiss. Bookmark the permalink. Congratulations Nancy & Daniel! Such great heritage. I wish you luck and adventure on your revamp. And I’d love to do a photoshoot once you’re done, tell the story of the home you’ve adopted. Thanks Toby it’s a great article a really awesome house!! Its actually 700 Ruprecht and my mom Nancy bougjt it and we are fixing it up now. This house was actually built for the mayor of Bella Villa in 1938 and we heard at one point there was a jail cell in the basement. Pretty cool place with a whole lot of character. Yes Toby we have bought this beauty.I started following this house sometime last year b4 even moving from Phoenix.Actually was looking forward to mowing the grass this weekend until STL. rain moved it.When finished,the house will have an eclectic flair with a big nod to the FLW era. Nancy, are you indicating that you have just bought the house at 701 Ruprecht? I love my new house.Thanks everybody for agreeinghow beautiful it is.It needs interior decoratiing.They left every wall dark and depressing gray and the woodwork even darker.We have some nice and light bathroom tile and lovely paint colors.i would really like to investigate the house after we get it finushed. Hi! I apologize for inconveniencing you but could you please send me an email at the email addy in my comment? I had a question regarding this site. Gracias! I live on Ruprecht from 1938 until 1957. The Wagner family were the first owners. There were 52 children in the first block (700 block) of Ruprecht who were all within four years of each other. It was the greatest street in the world to live on during the 40s and 50s. 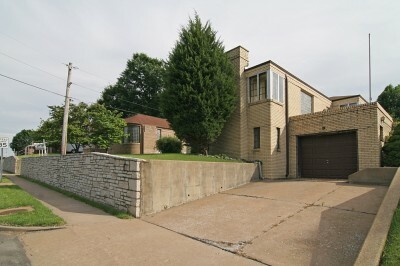 FYI: This house is currently for sale! I drove down Bayless today…slowly of course, and I noticed this house is now for sale. Again, glad to see that you’re venturing south! I love this house too! I can appreciate your caution in taking the pics of this house, Toby. Thanks to the paranoiac lunacies of the Bush administration, when I stop to take photos with my little Walgreens cheapie, I often feel eyes upon me–with the unspoken question “Should I call the cops or the Department of Homeland Security on this guy?” lingering in the air. has a certain Coral Courts feel to it.